The fighter’s for tomorrow night’s UFC 117 card have all now successfully weighed in for the event. There was one minor hiccup however when Thiago Alves came in a half pound over the 171lb limit. He will be given one extra hour to make weight however. 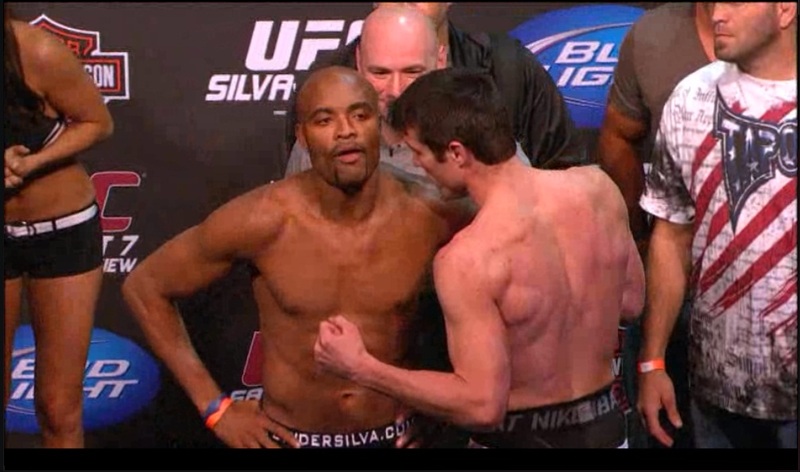 Meanwhile the most intriguing crowd reaction of the weigh-ins came during the headline bout between Anderson Silva and Chael Sonnen. The trash-talking challenger entered first and was met with a mixed response with considerable booing alongside the cheers. Meanwhile Silva stepped into a positive reaction from the crowd despite his performance at UFC 112 which had angered many fans. The best moment was yet to come though during the staredown. Yesterday Silva had got up close and personal, staring down Sonnen even when the challenger turned to be photographed by the press. On this occasion he switched it up though, facing the crowd and feigning disinterestwhile Sonnen was the one left staring at the side of his face. It was a humorous moment and a definite ‘one-up’ for Silva who’s often had to play second fiddle to the challenger during the pre-fight hype. See the official weigh-in results below.